Air Conditioners are a pain point for most people in our country who are concerned about their electricity bills. The moment an air conditioner is added to the list of appliances used in a household, the electricity bills increase significantly. Although it is difficult to significantly reduce the “big” impact of an air conditioner on your electricity bills, but still some of it can be managed by choosing the right technology, doing the right installation/maintenance/operation and by doing the right insulation of the room where the air conditioner is used. When it comes to technology, there were not many available in the past. When BEE actively started analyzing and labeling the air conditioners, we got some good one in form of 5 star air conditioners. The latest and the most efficient technology that is available in market today is the Inverter Technology for air conditioners. Inverter technology is designed in such a way that it can save 30-50% of electricity (units consumed) over a regular air conditioner. How does an air conditioner function? For most people, air conditioner just throws cool air at the temperature one sets it at. But does it really work that way? In principle, an air-conditioner during the cooling process, takes the indoor air, cools it by passing it through evaporator and throws it back in the room. It is quite opposite to how our good old air coolers used to work. Air coolers used to take outside air, cool it with water and throw it in. But air conditioners just work on internal air. Along with evaporator air conditioner also has a compressor that compresses the gas (refrigerant) in the AC to cool it that in turn cools the incoming internal air from the room. The compressor is either off or on. When it is on, it works at full capacity and consumes full electricity it is designed to consume. When the thermostat reaches the temperature level set in the AC, the compressor stops and the fan (in AC) continues to operate. When the thermostat senses that the temperature has increased, the compressor starts again. The inverter technology works like an accelerator in a car. When compressor needs more power, it gives it more power. When it needs less power, it gives less power. With this technology, the compressor is always on, but draws less power or more power depending on the temperature of the incoming air and the level set in the thermostat. The speed and power of the compressor is adjusted appropriately. This technology was developed in Japan and is being used there successfully for air conditioners and refrigerators. This technology is currently available only in split air conditioners. What is benefit of Inverter Technology? Every air conditioner is designed for a maximum peak load. So a 1.5hp AC is designed for a certain size of room and 1 hp for a different size. But not all rooms are of same size. 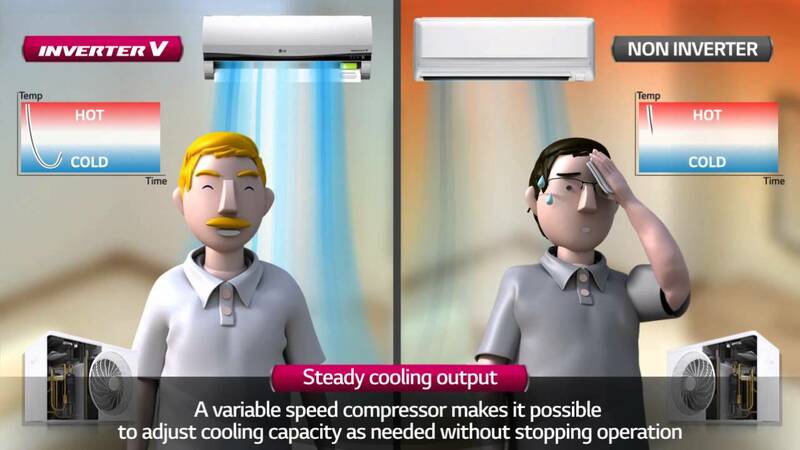 A regular air conditioner of 1.5hp capacity will always run at peak power requirement when the compressor is running. An air conditioner with inverter technology will run continuously but will draw only that much power that is required to keep the temperature stable at the level desired. So it kind of automatically adjusts its capacity based on the requirement of the room it is cooling. Thus drawing much less power and consuming lesser units of electricity. Although air conditioner with Inverter Technology adjusts its capacity based on the room requirement, it is very important to install a right sized air conditioner in a room. Please make sure that you evaluate the room and air conditioner capacity before you make a purchase. Keep watching for this space as we are in process of creating a comparison for electricity savings in various air conditioners brands.